Teaching photography is an important and enjoyable part of my business. I like meeting new people and sharing creative ideas. I have coached people of all ages and technical abilities, both in one-to-one sessions and small groups. When teaching I will do my very best to understand your interests and requirments and tailor the information accordingly. Please don't hesitate to get in touch if you would like to find out more, I am always happy to answer your questions. "Good teaching requires two crucial ingredients: a detailed and thorough understanding of the subject and the ability to communicate clearly, precisely and without resorting to jargon. Never are these more important than when teaching technical subjects to those who may not be technically minded. Alex has the enviable ability to cut straight through ‘technical haze’ and lift the shrouds of mystery that surrounds so much of photography and digital processing." "Hi Alex - just a quick note to say how much I enjoyed yesterday's excellent one-to-one tuition day. It was extremely useful and I learnt several brand new post-processing skills as well as having two very good sessions out 'in the field' shooting panoramas and multiple exposures for blending on the PC later." "The day I spent out in the Peak District really opened my eyes to different ways of looking at things I could take photos of. Alex was a really great help and showed me how I could make the most of the tools that I had to work with and the landscape around us- His enthusiasm is something incredibly special and really helped make the day a brilliant experience!" "I am an Octogenarian whose lifelong interest has been photography. The digital age of Photography has come as a distinct culture shock to me. The skills with film and darkroom that I had practised for many decades have all been superseded by the new technologies. I was struggling and needed help! My family bought me a day’s tuition with Alex Hyde. Alex proved brilliant. My cognitive skills are not what they were only a few years ago; but he was infinitely patient and was able to explain things slowly and simply in terms that I could understand. I have employed him many times since and with his help have made considerable progress. One of my pictures has been accepted for publication. I will continue to employ Alex Hyde for as long as he is prepared to teach me." The small group size (maximum of six) means that this course is suitable for photographers of all levels of experience. The workshop will be based in Bonsall Village Hall, giving us plenty of space to work in a relaxed setting. This is an indoor workshop, though you may wish to gather subjects from the surrounding footpaths. Please bring a packed lunch. Tea, coffee and biscuits will be provided. Please also bring the following equipment: DSLR camera (or mirrorless equivalent), macro lens, tripod and a flash gun with an off-camera lead or wireless triggering system as we will be using the flash off camera. A flash diffuser such as the Lastolite Micro Apollo 45 MKII is also helpful, but avoid the little ones that look like white yoghurt pots (see here) as they give relatively harsh light for macro photography. I have a few spare flash guns (Canon), off-camera leads and flash diffusers that can be borrowed on the day, though sharing may be required. We will be back in June 2021, email me if you want to be put on the reserve list! June sees the Tyrol’s alpine meadows in their full glory, with a spectacular show of wild flowers and an array of butterflies and other insects – in short, the perfect time for macro photography. We explore the many and varied meadows to discover gems such as the delicate burnt orchid hidden amongst the grasses, and along the way encounter many exciting and beautiful insects that flourish on the alpine slopes. In the locations we visit there is a good chance of finding the iconic Apollo butterfly. Moving higher up the slopes, the colourful meadows give way to swathes of vibrant alpenrose and high alpine species such as dwarf snowbell and trumpet gentian. A friendly, family-run hotel provides the perfect base for our week of photography and fresh mountain air. The tour has been designed to maximise the opportunities for macro photography. Wildlife photographers Alex Hyde and Nick Garbutt, along with a renowned local guide, will take you through everything you need to know to photograph the region’s fascinating plants and wildlife. 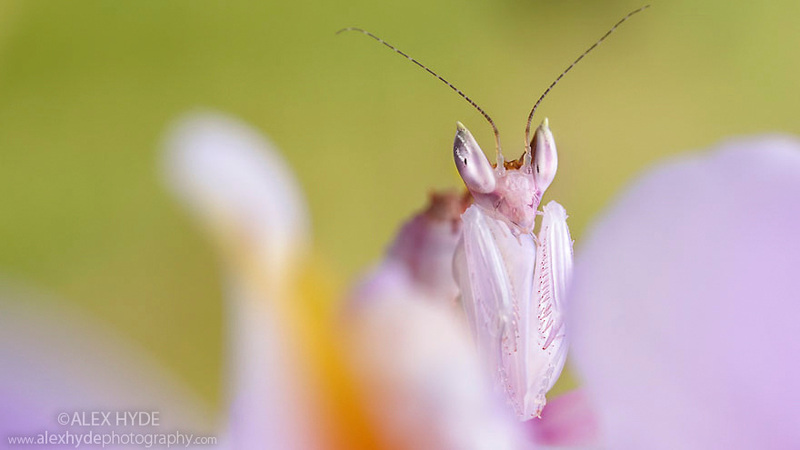 Alex Hyde has established himself as an expert in macro photography, and has taught at the University of Nottingham and at London’s Wild Photos photography festival. By understanding the behaviour of his subjects, he is able to capture intimate portraits of spiders, insects and other invertebrates in their natural habitats. An award-winning photographer and author with a background in zoology, Nick Garbutt has photographed wildlife all around the world and has led tours for the past 18 years. Join award-winning photographers Alex Hyde and Nick Garbutt, along with expert animal handler Jungle Jonathan, on this one-off photography workshop in Oxford. You will learn how to photograph a wide range of interesting small creatures, such as praying mantids, lizards and snakes. Whether you are looking to explore the world of close up photography for the first time or brush up on your photography skills before your next trip to the tropics, Alex and Nick look forward to sharing their photographic tips and techniques with you. Prices for all one day courses are £230 per day for one person (+£100 per additional person) excluding travel. If you would like me to design a day's tuition tailored to your requirments then please don't hesitate to contact me. As an alternative I also offer online tuition and mentoring, ideal if you want to get feedback on your photography or live outside of the UK. Please enquire for details. Starting from the very beginning, I will guide you through everything you need to know to become a confident digital SLR user. Learn the benefits of shooting RAW. Courses are based in the Peak District, Derbyshire where I live. If you need accommodation, I can recommend an excellent B&B nearby. This day-long session is based around what's seasonably available, making the most of what nature has to offer. This could include searching for fungi in ancient oak woodlands or roaming the limestone dales looking for wild flowers and insects. Whatever we end up photographing, you will be able to learn my favourite techniques in nature and macro photography. This will include use of off-camera flash, a skill that is central to my work. This course is usally based at your home, I can travel to you so long as you don't live too far away (I'm based in Derbyshire). Alternaitvely I can arrange for you to visit me in Derbyshire. You might have noticed that I have a soft spot for insects and spiders. I will bring a range of exciting subjects to your home, including a praying mantis or two. Your own props are also welcome, there is always plenty to photograph in the garden. I will also bring my photographic equipment for you to use, should you not own everything we need. 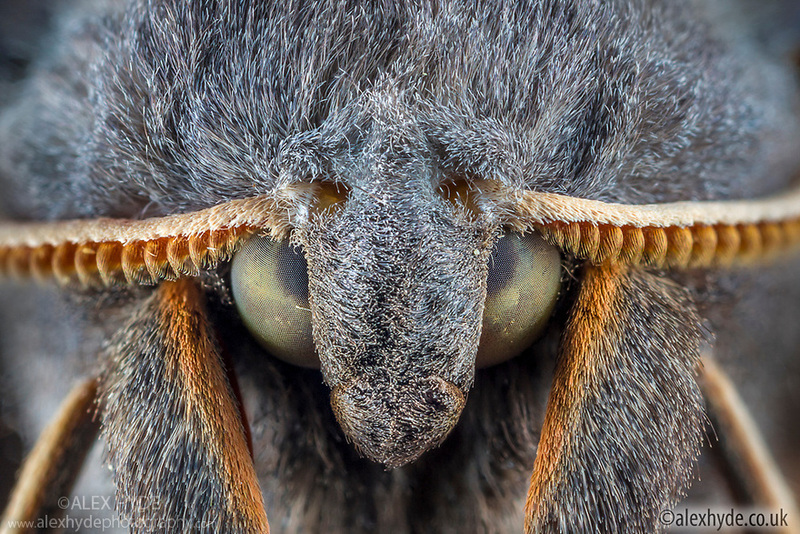 You will learn about using flash to light insects and other critters, allowing you to freeze the action, control your depth of field and unleash your creativity. Learn how to use focus stacking to extend your depth of field beyond what's possible in a single image. Requires an existing basic knowledge of digital SLR photography (though not flash). Please contact me for more information.